JOHNSTOWN, PA, February 22, 2018—Goodwill of the Southern Alleghenies’ Psychiatric Rehabilitation Program has been nominated and selected to receive the Pennsylvania Association of Psychiatric Rehabilitation Services (PAPRS) Outstanding Program Award, which honors an agency, or program within an agency, that operates psychiatric rehabilitation that effectively meets the needs of persons in recovery. Nominations are submitted annually by agencies, recipients of service, and individuals, and reviewed by the PAPRS Board of Directors. The four distinguished annual service awards presented at the PAPRS Annual Conference include Distinguished Career Award, Distinguished Advocate Award, Distinguished Practitioner Award, and Outstanding Program Award. Goodwill, when operating as Goodwill Industries of the Conemaugh Valley (1962-2016), is credited with planning and implementing the first Psychiatric Rehabilitation Program in Cambria County and began providing site-based services in January 2005. Goodwill was awarded this start-up funding after responding to a competitive request for proposals by Cambria County MH/MR (now Cambria County BH/ID). In December 2005, Goodwill achieved the distinction of being the first Psychiatric Rehabilitation Program to be state-licensed and certified in the Central Region. In 2006, Goodwill expanded to mobile services through a start-up grant awarded by Lee Initiatives Health and Welfare Endowment. Goodwill’s Psychiatric Rehabilitation Program is based on the Boston University Model of Psychiatric Rehabilitation in which Goodwill’s Certified Psychiatric Rehabilitation Practitioners provide a variety of services to help individuals to develop, reach, and maintain their individual rehabilitation goals. Services are provided at Goodwill’s program site in Johnstown and within the community. “I am very proud of the distinct history of our Psychiatric Rehabilitation Program. And now to be nominated by our peers and selected to receive this award, it is a great honor and a testament to the commitment of our staff,” stated Bradley R. Burger, President and CEO, Goodwill of the Southern Alleghenies. “They are truly dedicated to helping individuals to reach their goals of recovery, full community integration, and improved quality of life,” he added. Goodwill’s staff will be presented with its award at the PAPRS Annual Conference on April 11 at the Penn Stater Hotel & Conference Center Hotel in State College. 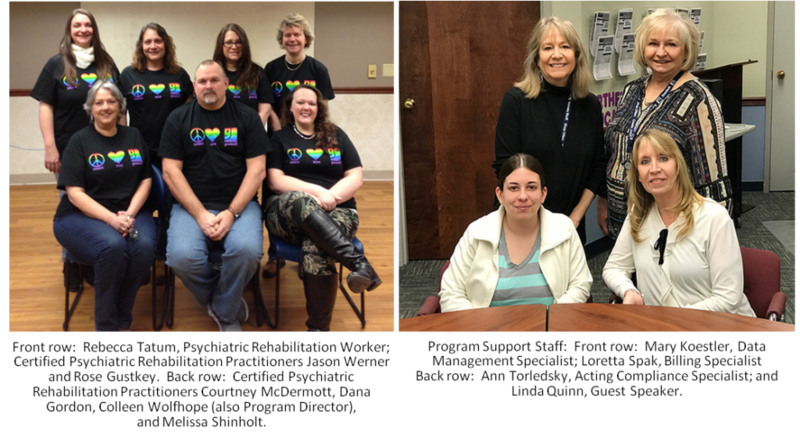 For more information on Goodwill’s Psychiatric Rehabilitation Program, contact Colleen Wolfhope at (814) 536-3536, ext. 306 or cwolfhope@gogoodwill.org.